Reminders of why recording cemeteries is so important are the Nuevo, Hoxton and Bancroft (Maiden Lane) cemeteries. The first two were sold, the remains moved, the history lost, the tombstones buried or lost or whatever they do with them when they do these things; the latter has just fallen into to such a state that there are just a handful of tombstones remaining. The remains from Nuevo cemetery were moved in 1974 to a small, out of the way cemetery in Brentwood. Originally, plaques were erected in memory of each of the 7,500 individuals moved, who were buried 1734-1876. Over 140 years of history was lost. However, no one seems to have thought of taking a few photos before the destruction of this part of the cemetery. Later burials remain in situ. The story of Hoxton is similar, opened in 1707, closed in 1878 and sold in the 1960s. A list of epitaphs written by Dyan Mendelssohn in 1929 are the only remaining records of those buried there. No photos were taken of the headstones and memorials prior to its conversion into a playing field. 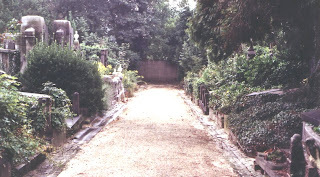 The remains were moved to West Ham Cemetery (above; photo credit: GenPals Cemetery Project), where, due to a shortage of space, some paths were dug up and the remains buried there. Only a few small plaques mark the areas. Click here for a short history of Hoxton Cemetery. Here's a great idea for a synagogue, Jewish genealogy or historical society to raise awareness of the value of Jewish cemeteries. Why not help to propose and organize a tour like the one below, in your area? Help the public learn what historical and genealogical information may be located in cemeteries. Don't forget to contact your local Jewish newspaper, community center, federation, schools or other institutions which may want to collaborate and even present additional related programs. Is a clean-up project necessary? Don't forget to include local Jewish youth groups or a nearby university Hillel center. In Monroe City, Louisiana, Temple B'nai Israel and the Ouachita Parish Library joined to present free walking tours of the Monroe City Cemetery and Temple B'nai Jewish Cemetery on October 26. A genealogy associate at the library - Lora Peppers - was the tour leader. According to the newspaper article, the event was introduced last year as a way to educate the public about the town by looking at the past. Peppers said that the city cemetery tours are always very popular but people often inquired about the nearby Jewish cemetery. B'nai Israel project chair Don Marcus agreed the combined tour was a good way for people to learn how Monroe's early citizens contributed to local history. He is also making plans for a January 24, 2009 concert to benefit the Jewish cemetery. Londoner Gaby Laws has been researching her family for more than eight years. The daughter of a survivor, her interest began by trying to find out what had happened to her family. This was combined with a love of history - she grew up above an antique shop - and a desire to be able to pass on, to her son, the stories her father could never tell. Angela Shire's interest in genealogy was sparked by the discovery of a diary written in the late-19th century by her husband's great-grandfather. Her researches have led to world-wide contacts with fellow genealogists and taken her to Krakow and various cities in Holland. Early Anglo-Jewish Genealogy remains her main focus. She is committed to locating new sources and, where possible, making access to existing records as widely and freely available as possible. It's just over a year since Angela Shire and I started GenPals.com but the idea had been brewing for sometime before that. To remember the exact reason we both decided to do it, is quite hard to quantify. Hopefully, the mix of my enthusiasm and Angela’s knowledge, experience and vast databases of information makes for a a useful tool for genealogists tracing their ancestors in the UK. Why do we spend our free time reading inscriptions, researching families and standing for hours at a time in cemeteries taking photos? It began in the most innocent of ways, a researcher asked about getting a photo of their ancestor’s tombstone on a forum. The cemetery mentioned, was not far from where a friend lives, so I asked him if he would take a picture and it snow balled from there. Why stop at one photo? For me, the loss of such valuable information became blatantly obvious on a trip to Dieweg Cemetery in Brussels. Everything had been arranged by a dear friend of mine, Jan Bousse. He had warned me of the state of the cemetery but it didn’t really sink in until we arrived there. We walked down paths looking at stones, no doubt erected by loving families, but now worn, broken, fallen, completly covered in vegetation and appearing totally unloved. My own ancestors’ tombstones had to be ‘uncovered’ by the caretaker, it took days apparently. Why are they all in such a state? I contented myself thinking that if it took me over five years to research my family and find where they were buried, then the same must apply to others. Add to the fact that many of the families of those buried at Dieweg were wiped out by the Holocaust and that may explain why these stones seem so forgotten. We still laugh at the reactions of all the people in the hotel foyer on our return from Dieweg Cemetery. It really was a sight to be seen. We hadn’t considered the problem of walking through to the lifts wearing mud splattered clothing, unusual hair adornments (twigs, leaves, more mud). It had rained and that along with crawling through the undergrowth did rather ruin our appearance. Those in the reception area were dressed for an evening out at the lovely local restaurants and there we were the mud-larks, we could ‘feel’ them staring and muttering. I’m getting used to that - you only have to tell friends that you are going to photograph a cemetery to get a similar reaction. Even when cared for, the headstones and monuments will decay, the memorials and epitaphs carefully worded by the families of each individual, the valuable information they contain, will be lost forever. So the work needs to be done – and that’s why! GenPals Cemetery Project now contains over 2,000 inscriptions and headstone photos from cemeteries in the UK along with mini-family trees. A total of 5,500 individuals are currently recorded with more coming soon. We have used numerous sources so that we could get to know each of the individuals listed, where they lived and what they did and have been delighted by the fabulous feedback received so far. Completed cemeteries in London include Brady Street, Brompton (Fulham Rd), Edmonton Western section, Bancroft (Maiden Lane). Others are Aldershot, Sheppey, Hartlepool, Middlesbrough, Bradford, Stockton and many more. You can search by using the name search facility or browse under headstones by name or headstones by cemetery. We have also included some history for most of the cemeteries along with a variety of items of interest. "From Here to Eternity: Jewish Cemetery Research, Preservation and Restoration" is an all-day seminar presented by the Lucille Gudis Memorial Fund of the New York Jewish Genealogical Society. The seminar will be held from 9am-4.45pm, Sunday, November 16 at the UJA-Federation located at 130 East 59th Street, New York City. There is a registration fee for the event, which includes a kosher buffet lunch. The fee, including a kosher buffet lunch, for members is $30; others, $36. the seminar, which includes the cost of a kosher buffet lunch. The registration form is here. Only advanced registration received by November 10 will be accepted; there will be no registration at the door. The JewishGen Online Worldwide Burial Registry (JOWBR): Joyce Field, JewishGen vice president (data acquisition). How to Catalog Jewish Cemeteries for the JOWBR: Ada Green, JGSNY Cemetery Project chair. Do Stones Speak? Interpreting Jewish Monuments: Visiting Jewish Cemeteries: Jewishdata.com founder Rabbi Abraham Laber. Cemetery Preservation and Restoration Panel: Chaim Bruder, Heritage Foundation for the Preservation of Jewish Cemeteries; Steve Lasky, founder, Museum of Family History; Norman Weinberg, executive coordinator, Poland Jewish Cemeteries Restoration Project. For the first three sessions and lunch, advance paid registration is required. The panel discussion, which begins at 2.30pm, is open for all JGS members as the regular monthly JGS meeting. Gen Business: Feed problems resolved! Thanks to the eagle eyes and technical expertise of geneablogger colleague Amir Dekel, we think the feed problems have been resolved. Hooray! The help pf Feedburner expert Franklin in far-off Hong Kong was also invaluable. Please let Jewish Graveyard Rabbit know if you experience any problems with feeds, with subscribing by email or RSS, or any other problem. Also, if there are topics you would like to see covered in JGR, let us know. The Friends of Jewish Dokshitsy was formed in 2005 to perpetuate the memory of the Jewish residents of Dokshitsy, Parafianov, and nearby villages in Belarus by preserving the remnants of the Jewish Cemetery in Dokshitsy and undertaking other projects consistent with this goal. According to Aaron Ginsburg, president of the non-profit organization, the town (68 miles from Minsk) recently re-erected 134 tombstones on the Jewish cemetery grounds, destroyed in 1965. Most of the stones were buried under a road for four decades. In 1942, the Germans killed more than 3,000 Jewish men, women and children, who were buried in a mass grave across from the cemetery. In 1964, the Jewish cemetery was destroyed and, a year later, a park was constructed there. In 2005, repairs on a street revealed the gravestones from the cemetery that had been buried since 1965. I was in the right place at the right time. I had long been interested in history and Jewish history, and more recently in my family history. I believe that the message of Judaism is about respecting each other. This extends to respecting those who preceded us. So I was ready to respond to the surprisingly friendly message from Belarus. Joining with others, I created The Friends of Jewish Dokshitsy, Inc., and sought out descendants to help the citizens of Dokshitsy save their and our Jewish history. The Dokshitsy District Soviet considers it is necessary to preserve the remnants of the Jewish Cemetery: to beautify the place, to install a memorial. ... We hope for your support and understanding in the intention to create a Memorial to the hundreds of Jewish citizens of Dokshitsy. The dedication was on May 23, 2008, which was Lag B'Omer on the Jewish calendar. On Lag B'Omer (in 1942) and on the following days, most of the Dokshitsy ghetto's Jewish inhabitants were murdered in the town or in the ravine across the street from the Jewish cemetery and buried in a mass grave. Friends and family from the US, Israel, South Africa and Moscow gathered for the dedication. As an example of a common emigration pattern, families from one shtetl transplanted themselves into towns where their neighbors had already settled, thus many Dokshitsy families settled in Newport (Rhode Island), Brooklyn (New York), Waterbury (Connecticut), Sheboygan (Wisconsin), Cleveland (Ohio) and Memphis (Tennessee). Read about the group's work at Jewish Dokshitsy and view photos of the tombstones here..
Read more about the town and its history here. There is also a Dokshitz Shetlinks Page on JewishGen with more information. Aaron seeks help in translating the inscriptions on the 134 stones. If you would like to help, have questions or need more information, contact him. The town is located at 48°17'N; 25°56'E. Originally in Austro-Hungary, Bukovina, then Romania, it is today in Ukraine. Researchers interested in the Czernowitz-Sadagora area will find in the Czernowitz-L Discussion Group website a diverse and extensive collection of material concerning the Jewish community, as well as a wealth of information on the cemetery, including historic and contemporary photographs along with images of burial register pages. In fact, researchers considering a collaborative project for their shtetl will also find excellent ideas that may be adapted. Recently, the group participated in a Cemetery Clean-up Project. - A PowerPoint presentation of the 2008 Work Camp Cemetery Clean-up Project. Photos by Joanna Liss; PowerPoint by Hardy Breier. - Report and photos from Christian Herrmann and Mimi Taylor on the 2008 International Work Camp Cemetery Clean-up Project. - Photographs from the sucessful 2008 Cemetery Clean-up Project. 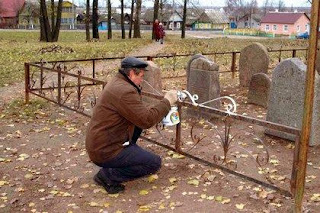 - The 2008 Czernowitz Cemetery Clean-up Project. - The Burial Register Transcription project: A chronological description of activities by Bruce Reisch, along with images of the various burial registers connected with the first project. - The Czernowitz cemetery map from Mimi Taylor Bruce Reisch's cross referenced map of the new areas compared to the old parcels at the cemetery. - May 2006 Reunion photos of the memorial service at the Czernowitz cemetery, from Rita and Gidi Shilo. There is much more to explore on the Czernowitz site http://czernowitz.ehpes.com/. JewishTravel.Pl offers information about sites of Jewish interest, including a list of Polish cemeteries, and also arranges tours. President/founder Tomek Kuncewicz is director of the Auschwitz Jewish Center. Co-founder/International Affairs vice president Daniel Feldman is completing a PhD in Shoah history and literature at Yale University. Co-founder/Specialized Tours vice president Kate Craddy works for the Auschwitz-Birkenau State Museum. Read more about them here. There's an interactive map based on proposed tours of various geographical locations. This is an interesting feature pointing up Jewish sites in these places. However, the real interest for the Jewish Graveyard Rabbit is the place index, billed as an introduction to all known places in Poland with remaining sites of Jewish interest. Enter the keyword "cemetery" and view a long alphabetical list of towns with Jewish cemeteries. Caveat: While some entries have more detail, many merely say "one Jewish cemetery remains." Tip: To find more information on the town cemeteries listed on JewishTravel.pl , google the town of interest. Under Zdunska Wola (in Lodz District, Sieradz Province), it says merely "Both a Jewish cemetery and former synagogue building remain." Google zdunska wola jewish cemetery and view nearly 600 results for more information. Zdunska Wola's cemetery is undergoing an ongoing major restoration and preservation project, and contains unusual colored tombstones. This is the project of Dr. Daniel Wagner of the Weizman Institute (Israel) and a team of dedicated researchers in Poland, Israel and elsewhere. Wagner's own site is here, where he writes "I believe that the total number of gravestones is probably as high as 1200 or more. It is the largest Jewish cemetery in the Sieradz region. The oldest gravestone is that of Elazar LIPSZYC, who died in 1837. The last recorded Jewish burials were in 1946. Take a look for your own ancestral towns in the list at JewishTravel.pl at the link above. Contributor Daniel Horowitz of Israel is originally from Caracas, Venezuela. He is the Horowitz Family Association webmaster and board member and webmaster of the International Association of Jewish Genealogical Societies (IAJGS). Jewish cemeteries provide documents - not written on paper but on stone - that can provide critical genealogical information. The gravestones are called, in Hebrew, matzeva (singular) or matzevot (plural) and generally contain each individual's basic information. They contain fascinating and useful information about the deceased person. What can you learn by visiting a Jewish cemetery? - The deceased's secular given name and family name. - The Hebrew given name. - Hebrew name of the deceased's father. - Date and place of death. If the tombstone reads: "To our beloved husband, father, grandfather and brother," it means that he had a wife, children, grandchildren and brothers/siblings still living after the person died. - Don't visit on a Friday (you will have less time), Saturday or Jewish holidays (it will be closed). - Bring sufficient charts (or simple paper and pencil) to record the data. - Bring a camera to photograph tombstones. Take some photos of the surroundings to identify the grave's location. Photograph the map of the cemetery (if there is one) to later mark the grave's exact location. - Bring candles, matches, a prayer book, and some small stones. It is a Jewish tradition when visiting a grave to light a candle, place a small stone (for remembrance) and say a prayer. - Bring gloves, gardening tools and old clothes. Clothing can be easily soiled or torn in an overgrown cemetery, and you may have to clean and prune around the tombstone to read it. - Look at the graves near the one you are visiting. In general, relatives are buried in the same area. You may never know who is buried nearby unless you check the area. - If there is a cemetery office, ask for any available additional information. You can always find somebody willing to help you. Adapted from the study guide "Searching for My Roots" Copyright © 2005 Daniel Horowitz. All rights reserved. ISBN: 978-965-91237-1-1, Israel. I must confess that I had never heard this term before and, each time I write this phrase, I tend to write "rabbi" instead of "rabbit," which is appropriate for a blog focused on Jewish cemeteries. 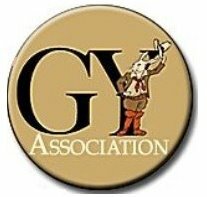 The premise for the association is that member blogs will be devoted exclusively to cemeteries, grave markers, burial customs and thus promote the study of cemeteries, the preservation of cemeteries, and transcription of genealogical/historical information that may be found in cemeteries. Although the association has asked member blogs to focus on a limited scope, the Jewish Graveyard Rabbit will be somewhat different. The JGR will be international in scope, with a team of contributors providing expert knowledge of cemeteries around the world in all countries, preservation/restoration projects, Jewish burial and mourning customs, Jewish tombstone symbols and how to read a Hebrew tombstone to learn what genealogical information may be gleaned. Where differences exist, the blog will address Ashkenazi, Sephardi and Mizrahi customs and issues. 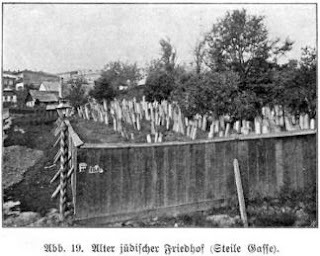 Photographs will be included, as well as extensive links to sites providing relevant Jewish cemetery information. A team of writers is being gathered, and others are invited to contribute appropriate postings. If you would like to be part of this effort, email jgrarab@yahoo.com, provide contact details, proposed topic/country, etc. We are looking forward to this new endeavor and invite you to join as contributor or reader.